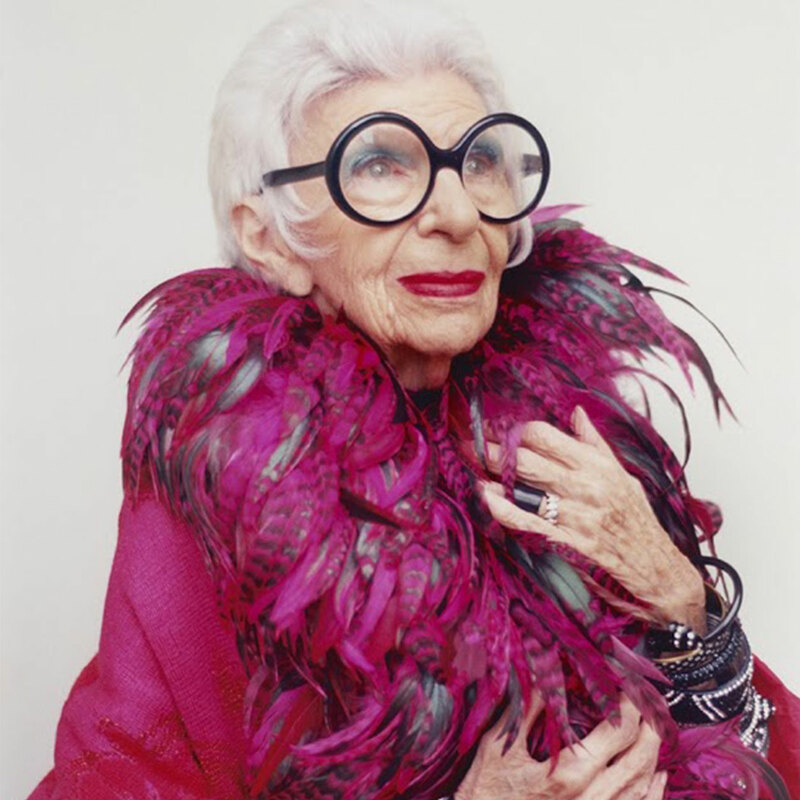 If you don’t know who Iris Apfel is, you are seriously missing out. I’ll admit that until recently, I wasn’t quite sure who she was. I recognized her from her signature round, oversized glasses and white hair. I knew she had something to do with the fashion world. But I wasn’t exactly sure what that ‘something’ was. 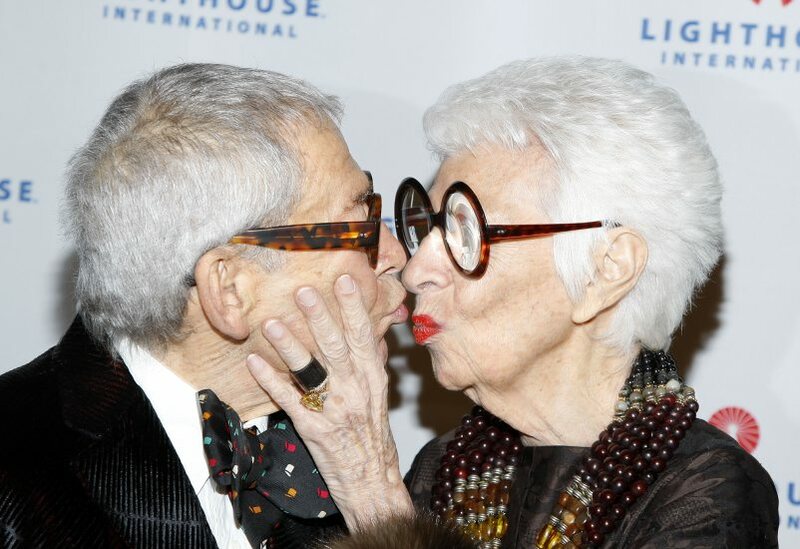 I recently came across Iris, a 2014 documentary about Apfel shot by the late legendary filmmaker Albert Maysles, on the streaming site. I always thought Ms. Apfel looked cool in photos, and of course I can appreciate a bold eyeglass frame. I decided to give the documentary a try – I could always switch to something mindless if it didn’t keep my interest. Fast-forward to the end of the documentary, and I found myself Googling “Iris Apfel mailing address” so I could express my intense appreciation for her in writing. While I didn’t find an address, I thought sharing the greatness that is Iris in blog form would be the next best thing. Through my supplementary research, I learned that the now 94-year-old has been interested in fashion since she was eight years old. Iris attended NYU and the University of Wisconsin. She even worked as a ‘copy girl’ at Women’s Wear Daily in the 1940’s. She worked for interior designer Elinor Johnson as well as illustrator Robert Goodman. The documentary went on to inform me that Apfel and her husband Carl opened a textile firm in 1950 called Old World Weavers. The couple created custom textiles for wealthy clients, and with continued success they went on to travel the world in search of inspiration. Iris recalls scouring souks and markets for unique, worldly pieces. The pair was even hired by nine presidents to complete restorations in the White House. In 1992, they received an offer they couldn’t refuse, and sold Old World Weavers. Iris’s worldwide inspiration didn’t end there, though. The documentary follows the icon as she barters in African shops in Harlem and sifts through thrift store merchandise. In one flea market scene, Iris buys a bright red, studded flat brim hat for Carl – who is 100-years-old at the time of filming. Iris’ sense of style is unlike anything I’ve seen, particularly for a woman of her age. She carries herself with such confidence and self-assuredness that people can’t help but take her seriously, even in the craziest of ensembles. She knows what she wants and does not take no for an answer. Iris recalls being one of the first women to wear jeans in the 1940’s. It was deemed inappropriate for a female to wear jeans at that time, but Iris haunted a shop owner for six weeks until he made her a pair to get her off his back. However, despite her strong will, Iris is anything but curmudgeonly. In one scene, she stops the procession of the red carpet to invite an old friend to dinner at her place. She ignores the flashbulbs of the cameras to bend down and affectionately rub the head of her husband, seated in a wheelchair beside her. In another scene, as she poses in front of an artistic rendering of herself, she reaches out and holds the hand of her doorman, inviting him into the frame. When Iris meets Kanye West, she tells him that she is a big fan of his. When he tells her she looks great, she blushes. Later, when she meets Jenna Lyons, Iris talks about how impressed she is by the J.Crew Creative Director and President, although Lyons insists it is the other way around. Part of what launched the cult-like fame around Apfel was an exhibition at the renowned Costume Institute at the Metropolitan Museum of Art in New York City. When the Institute’s original exhibit fell through, Iris was approached and asked if she would be willing to show off her collection of couture costume jewelry – one of the two largest collections in the country. The curators decided it would make more of an impact if they also showed some full outfits alongside the jewels to show the power of transformation in accessories. It snowballed into an unforgettable and whimsical exhibit. And whimsical she is. The documentary peeks inside the Apfel’s Palm Beach, Florida apartment. Every inch of the space is filled with games, stuffed animals, and trippy trinkets. In anyone else’s home it would look kitschy – in Iris’, it looks high fashion. The home has a toy store feel, which alludes to the childlike personalities of both Iris and Carl – in the best way possible. The couple leaves the Christmas lights and decorations up for eight months out of the year. Every figurine tells a story, and each is artfully placed. As she shows us around the space, she stops to say hello to a stuffed Kermit the Frog, seated atop the ostrich-statue-turned-bar. “Kermit decided he’d love to live here, and he’s become a terrible lush. See how tipsy he is?” It’s impossible not to fall in love with her wit. She shows us a large dog statue and explains how it took her years to find the right statement necklace to fit both the dog’s ceramic neck as well as his personality. Apfel was asked to decorate one of the world-renowned Bergdorf Goodman window displays. She painstakingly styled each mannequin with layers of baubles. Nothing was an accident – she took control of everything down to the way her feather boa sat in a mannequin’s hand. Each mannequin’s face remained empty except for an oversized pair of spectacles. Perhaps the most poignant aspect of Iris is the relationship between Iris and her husband, Carl. The pair has a silly, dry rapport. Although Iris often pretends to roll her eyes at Carl, the camera repeatedly pans down to their wrinkled, pale hands intertwined. As wheelchair-bound Carl watches Iris try on clothes in a vintage shop, he sings out of tune: “That’s where my money goes, to buy my baby’s clothes!” The love between the two is palpable. He later remarks how lucky he is to have such a talented wife – “I think I’ll keep her,” he jokes. Towards the end of the film, Iris admits that she has just had surgery but kept it a secret from her husband. He is “so devoted to me,” she reveals, with sadness in her eyes. She didn’t want to worry him. Heartbreakingly, Carl passed away on August 1st, a few days shy of his 101st birthday. [because] life is gray and dull, and you might as well have a little fun when you dress.” I couldn’t have said it better myself, sister. Head to Netflix to check out Iris and let me know what you think! I hope you love it as much as I do. He definitely did! Love you!